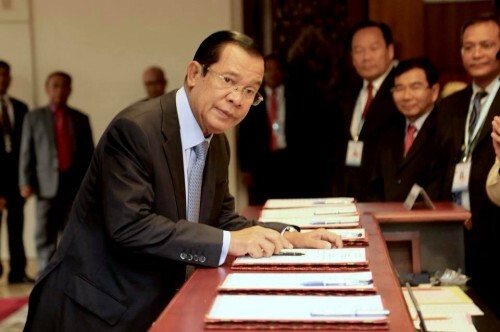 Speaking at the National Assembly’s session on 6 September 2018 at the National Assembly, Cambodian Prime Minister Hun Sen said that the new mandate government committed to implement a special political program for Cambodian progress. (1) ensure peace, stability, security and village safety for the well-being of the people; protect independence and territorial integrity. (2) strengthen socio-economic development in all areas prioritizing governance reforms aimed at strengthening public institutions and building a clean administration and efficient public service; ensure macroeconomic stability to support sustainable, inclusive, and equitable growth; invest in human capital; promote public and private investment on hard and soft infrastructure; strengthen financial inclusivity, provide small and medium-sized financial services, and rural loan services for small and medium-sized enterprises and for low-income earners at appropriate low interest rates. (3) provide quality employment and vocational training to youth; help farmers to expand production and market access for agricultural products at suitable prices; raise salaries, other benefits, and improve working conditions and ensure employments for workers, increase pension fees to all public officials as well as retirees and veterans; widen electricity supply and lower electricity costs, and the cost of education in rural areas. (4) strengthen social protection policy on the principles of efficiency and sustainablity, particularly for the unfortunate and vulnerable groups. Specific measures to be implemented in 2019 include: promote the wages of workers and employees as they will receive their continuous wages regularly for every two weeks through banking system; increase salaries every year for civil servants, teachers, and armed forces; and raise pensions for retirees and veterans to improve their livelihoods; reduce electricity cost in 2019-2020; implement social protection policy prioritizing pregnant women and children under two years old.